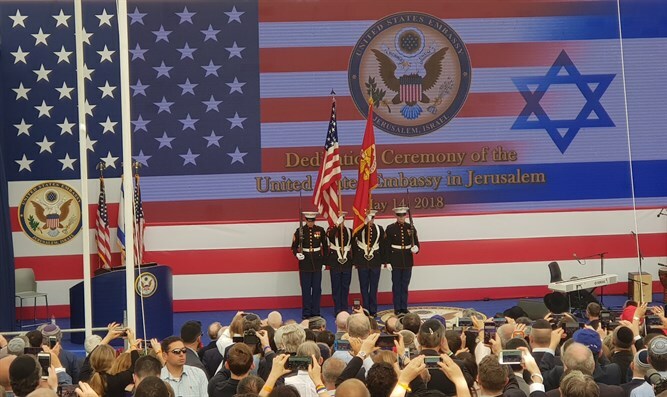 US unveils its new embassy in Jerusalem's Arnona neighborhood. Trump: We acknowledge Israel's right to determine its own capital. The US embassy in Jerusalem, Israel officially opened Monday afternoon. US Ambassador to Israel David Friedman spoke at the opening ceremony. "On this exact day 70 years ago, at almost this exact time, David Ben Gurion declared Israel's independence. Just 11 minutes later, President Harry Truman caused the United States to be the first nation to recognize the reborn State of Israel. He later regretted that he waited so long," Ambassador Friedman said. "70 years since that memorable event, almost to the minute, the United States finally takes the next step: a step awaited, voted upon, litigated, and prayed for for all these years. Today, we open the United States embassy in Jerusalem, Israel," he declared. The ambassador credited US President Donald Trump for having the courage to open an embassy in Israel's capital. "Today's historic event is attributed to the vision, the courage, and the moral clarity of one person to whom we owe an enormous and eternal debt of gratitude, President Donald J. Trump." "Today, we keep our promise to the American people, and we extend to Israel the same right that we extend to every other nation, the right to designate its capital city. A capital city, I should add, which houses all three seats of government, with a 3,000 year old history dating back to the time when King David made Jerusalem the capital of ancient Israel. "Jerusalem has inspired Americans since well before the founding of our republic," Friedman continued. John Winthrop, in 1630, as he approached Massachusetts Bay, spoke of his quest to build the 'new Jerusalem' as a City on a Hill,' a phrase expanded by President Reagan to be a 'Shining City on a Hill.' The United States established its consulate in 1844, 104 years before the birth of the State of Israel. And President Lincoln, relaxing for the first time in years as the Civil War came to an end, told his wife Mary that it was finally time for him to take some rest. And he expressed his hope and desire to visit the holy city of Jerusalem." President Trump addressed the ceremony in a pre-recorded video. "Israel is a sovereign nation, with the right, like any other sovereign nation, to determine its own capital. Yet for many years we failed to acknowledge the obvious, the plain reality that Israel's capital is Jerusalem." "On December 6, 2017, at my direction, the United States finally and officially recognized Jerusalem as the true capital of Israel. Today we follow through on this recognition and open our embassy in the sacred land of Jerusalem," Trump said. "The United States will always be a a great friend of Israel and a partner in the cause of freedom and peace." In addition to Ambassador Friedman, the US delegation to the event included Deputy Secretary of State John Sullivan, President Trump's special envoy to the Middle East Jason Greenblatt, Treasury Secretary Steve Mnuchin, Florida Governor Rick Scott, Senators Lindsey Graham, Ted Cruz, Mike Lee and Dean Heller, congressman Joe Wilson, former US Ambassador to Israel Dan Shapiro and First Daughter Ivanka Trump and her husband Jared Kushner. Correction: A previous version of this article reported that Democratic Congressman Ted Deutch (FL-22) was part of the US delegation to Jerusalem. While Mr. Deutch's name had been listed in a press release distributed by organizers of a reception committee in Jerusalem for the US delegation, the congressman's office informed Arutz Sheva that Mr. Deutch was not part of the delegation to Jerusalem, and did not travel to Israel this week.